Don and Glenda Moore have worked side by side in the plumbing business for nearly 22 years in Florence, Oregon. First for Pelican Plumbing until they went out of business in 2001. And again when they opened up Integrity Plumbing in June 2001. Since then they have worked hard to live up to the name, in·teg·ri·ty \in-ˈte-grə-tē\ – n. Steadfast adherence to a strict moral or ethical code. Don has been plumbing for 31 years and has gained much experience in residential work as well as commercial, Don’s experience and knowledge is well rounded and he can do all phases of plumbing. He really enjoys a good challenge such as boiler rooms and complex custom homes but truthfully he loves it all. We are a family owned and operated business. For those that come to work for us that aren’t family, well, after a while they are adopted in! Glenda remembers interviewing one plumber early on and couldn’t believe what he said, “Well, you just make a shoddy repair that holds just for a year and then they have to call you right? You get more work that way right?” Needless to say he did NOT get a job with us! Our priority has and always will be our customers, we know without them we are nothing. We treat our customers the way we want to be treated, we treat our customers and their homes with the utmost respect. We also clean up after ourselves, never leaving a mess for the homeowner to clean after we’re done. When we first arrived in Florence more than 20 years ago with our four kids, two dogs, our 30 foot travel trailer and $1000.00 in our pocket we had a lot of ambition and big dreams. We did need some help that first year too. The Soroptimist’s of Florence and the Florence Food Share helped us out and we have never forgotten that, we have always given back to these and other organizations. We are people who live up to our word, where a hand shake means something. Where “Yes” means “Yes”, but just as importantly “No” means “NO”! So many times in business we have been taken aback because of the shrewd practices of some, but there have been so many great and wonderful people along the way that it makes all the hard times worth it. 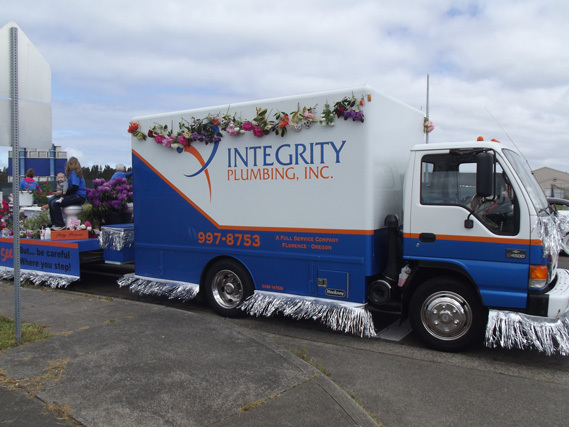 We at Integrity Plumbing, Inc. are proud to be serving the Florence, Oregon area and surrounding community. Our goal has always been to "treat others as you want to be treated". We offer our customers peace of mind while their work is being performed, because we have already given a "price up front" so you don't need to sit and bite your nails while the plumber is working, you already know the cost. Most people prefer this method, (you don’t have to be wondering if you got the slowest guy in the shop, or if he knows what he is doing). We also offer the longest warranty of any one in our area. We keep a big stock of most commonly used parts. We have a larger workforce so we can change the schedule to accommodate the "emergency" plumbing call. We have a full time office staff that is ready to take your call and keep you up to date with the schedule of your plumber, so you're not left hanging for hours wondering if he will even show up. Our plumbers are skilled tradesman that are continuously furthering their knowledge of the latest products. They each have an area of expertise, so if you have a difficult plumbing situation chances are we have the right plumber for you. We never compromise quality for any reason.